Susan Carew has an Economics and Marketing degree from Griffith University in 1991, Brisbane, Australia. Susan is a Graduate in Peace Studies from La Trobe University in 2002, Melbourne, Australia. Susan has completed a Certificate IV in Training and Assessment at KAL Multi-Media in 2007, Melbourne. Susan completed certificate in Peace and Conflict Studies, Rotary Scholarship, Bangkok, Thailand, 2008. Susan Carew is the Founder of WorldPeacefull. Susan has produced innovative training programs to engage schools, organisations and the general community in harmony, wellbeing and conflict resolution. The programs are unique in that they incorporate humour and encourage positive thinking to enhance harmony. The focus in the training is to develop resiliency, conflict resolution skills, positive and creative approaches to problems and solutions. In 2002 Susan was personally invited to travel to Russia by the renowned clown Dr Patch Adams to explore creating positive environments through clowning and creative arts. He explained the trip was to create an experience of selfless service through love in action. After completing a Graduate Diploma in Peace Studies at La Trobe Susan and developed the REAL HOPES model. REAL HOPES is an innovative anti bullying peace education program for primary (elementary) school aged children. This program is unique as it incorporates values, peace, nonviolence and anti-bullying, utilising the powerful symbol of the clown as facilitator. It has been widely successful amongst the participating students, teachers and Principals. As a Rotary Scholar Susan completed the Rotary Peace and Conflict Studies program in Bangkok, Thailand. During this time she travelled through Thailand, Cambodia and Vietnam, studying conflicts. She also clowned in a 40,000 refugee camp, HIV clinic, Mental Health Hospital and presented the first workshop on healing and humour to health professionals in Thailand. 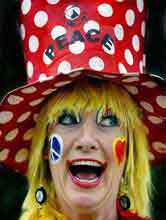 Susan Carew travelled the World in 2010 as a World Peace Clown visiting 20 countries in 6 months including: Thailand, India, Egypt, Greece, UK, Ireland, USA, Mexico, Belize, El Salvador, Costa Rica, Peru, Boliva, Argentina, Chile and New Zealand. She clowned on the streets, taught in schools, hospitals and orphanages. She spoke to people about peace in their country and in the world. She found herself exploring the sustainability issue as she was travelling and as a result the Rotary Peace Award was born. Visit http://www.worldpeacefull.com/travelling-the-world-for-peace-albums/ for a photo record of the world trip. Susan personally lives and is inspired by Gandhi’s words ‘to be the change you wish to see in the world’. She believes when we all take responsibility for the world as it is today, then decide to make a new decision that a better world is possible, it will surely happen. Working with children has taught Susan that children just need the encouragement and tools to make a difference, for they will create a world worth living for.